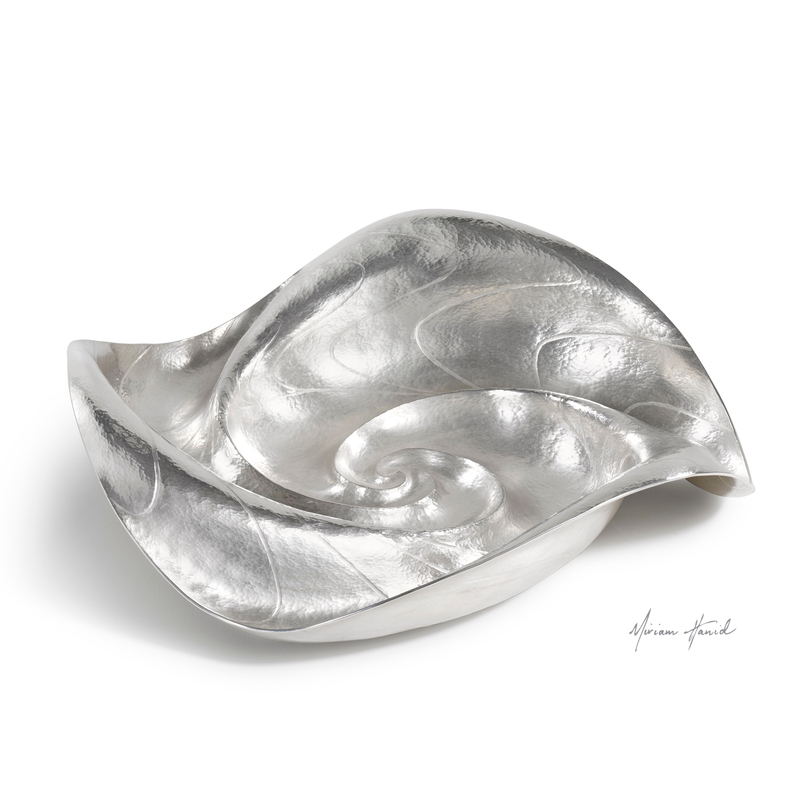 We started working with artist and silversmith Miriam Hanid in 2016, focusing first on the redevelopment of her online profile including a new logo and website. We continue to offer support with her creative communications on a regular basis. Read an earlier review of Miriam’s work when it was on show in the Fine Lines exhibition at The Scottish Gallery in 2015. 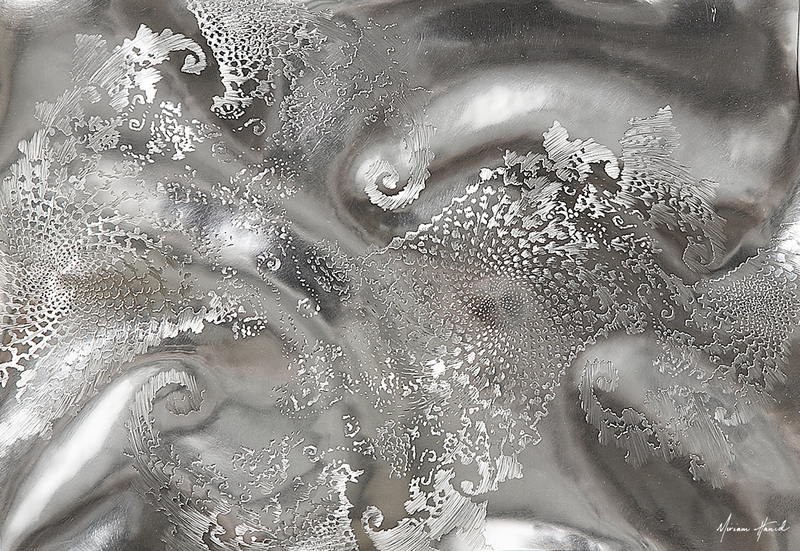 “I use the silversmithing techniques of chasing, repoussé and hand engraving. The fluidity and movement of flowing water inspires my collection of ‘paintings in metal’. 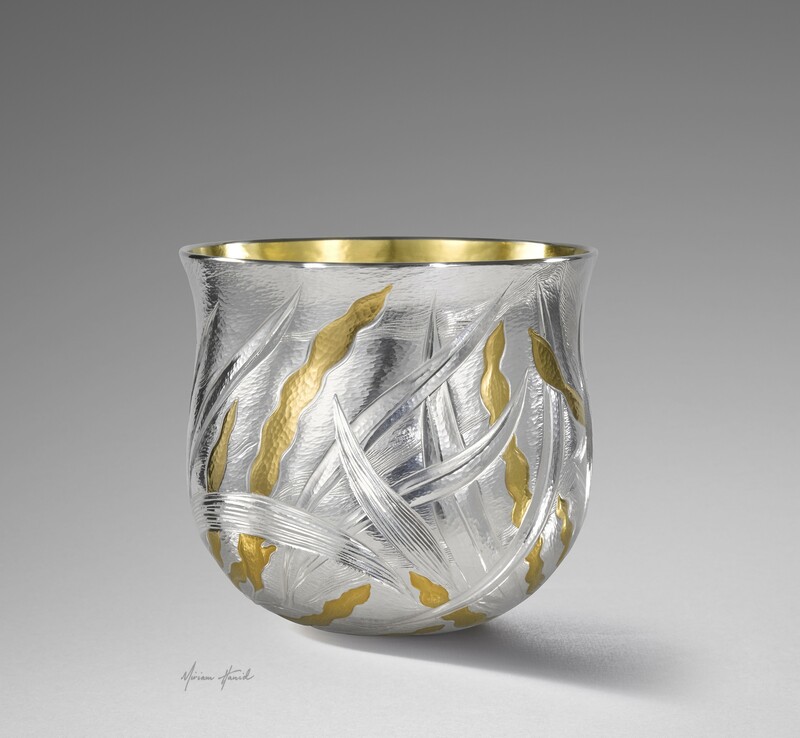 Miriam has been working as a professional silversmith since 2008, creating pieces for private clients and public commissions, including the Worshipful Company of Goldsmiths, New College Oxford, The Victoria and Albert Museum and the National Museum of Wales. Her work has been exhibited in numerous exhibitions throughout the UK and internationally, including the Victoria and Albert Museum, KunstHalle Wurth, Germany and Liang Yi Museum, Hong Kong ; ‘Collect’ at the New Saatchi Gallery; The Worshipful Company of Goldsmiths, London; The National Museum of Scotland, Edinburgh; Inorghenta, Germany; Petronas Towers, Malaysia; and Häme Castle, Finland. 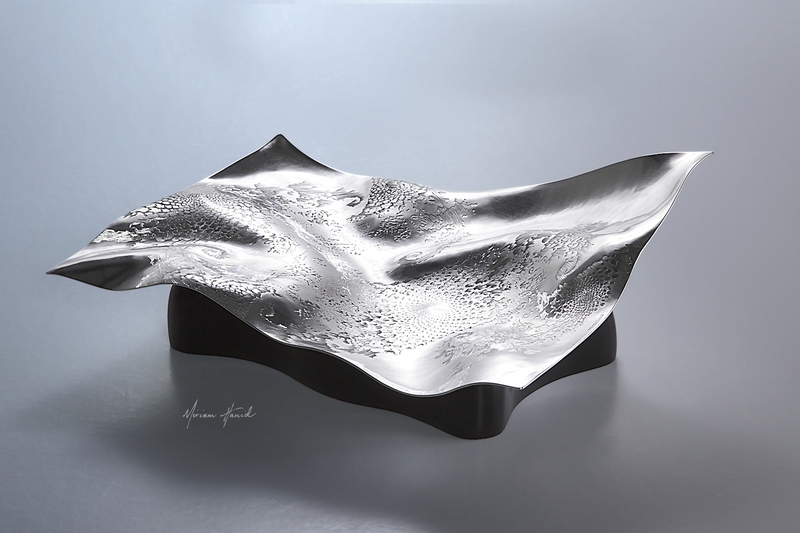 ‘Crystalline’, Sterling Silver (21 x 29 x 10 cms) – hand engraved, formed on wood, with carved cherry base. ‘Crystalline’ reveals the extraordinary molecular substance of water. The fractular detail highlights the silver’s surface. ‘Crystalline': transmitting light; to be seen through with clarity. 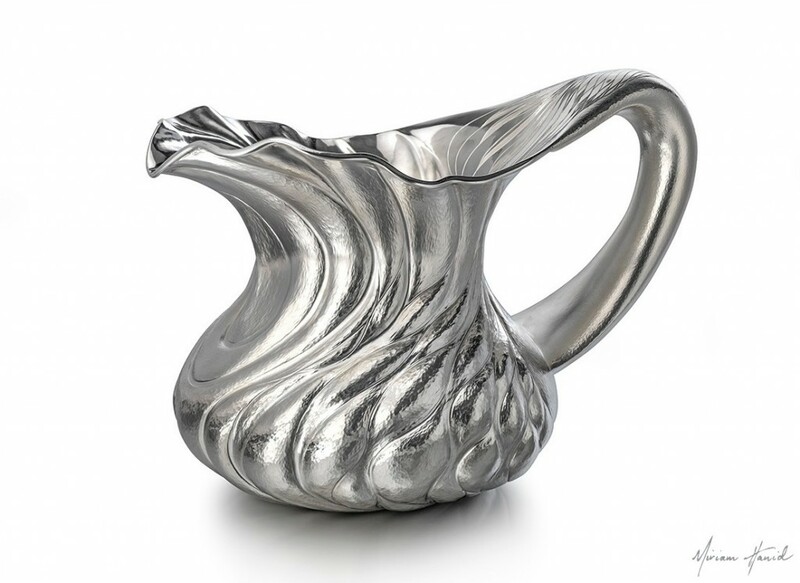 ‘Cascade Bud Vase’ (130 x 90 x 90 cms) designed to hold just one or two flowers. 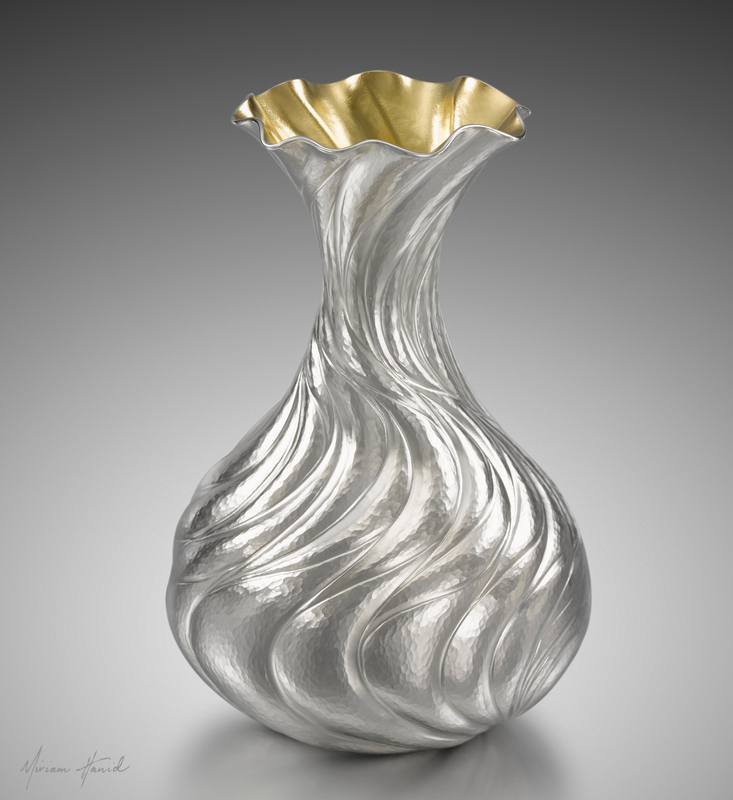 Hand chased in fine silver, with a lemon gilt interior. Find out more about Miriam and her work on her website.